Handy size, and works well on the hob or in the oven. Will get a lot of use! So far I have found this to be a useful pan for stove to oven or oven only situations. I use this pan on a gas stove, and while i probably wouldn't substitute a frypan for this one due to the short handles, for oven use i believe it is more practical. It's well sized and very sturdy, and I've had no issues cleaning it after roasting with it. I wanted a pan that goes from stove to the oven and this is a great find. I used this gratin pan to pan fried pork chops on the stove and then put it in the oven to continued cooking. 483 customers found this review helpful. Did you? Yes, I did! 572 customers found this review helpful. Did you? Yes, I did! A beautiful combination of both form and function. Very versatile pan, which cooks to perfection. I will get a lot of use out of this! 512 customers found this review helpful. Did you? Yes, I did! I love the pans with small 'ear' handles, and this is no exception, because I can use them just as easily in the oven as on the stove. So this serves as a frying pan, a gratin pan, a pan in which to brown thick chops before finishing them in the oven. Love it. The copper distributes the heat beautifully, the stainless interior cleans with ease. 503 customers found this review helpful. Did you? Yes, I did! My wife is delighted that I am doing more of the cooking since purchasing the round Au Gratin pan. 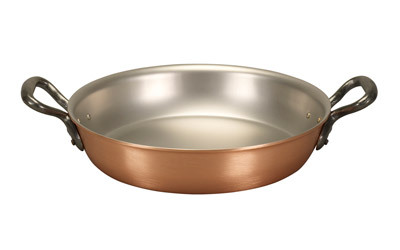 It is truly an aesthetic working piece to have in any kitchen and I love the versability of the pan. I did a lot of online research before I decided on Faulk Culinair and I am very pleased with my purchase. Well done for stocking a high quality product that should last a very long time. 563 customers found this review helpful. Did you? Yes, I did! I have been trying different styles and fun ways of cooking food. I seen in some cultures where they use a portable gas stove on a table and place some sort of pan on it and grill a variety of raw food. I had tried different pans and they has always been a disapointment. This particular pan allows me to cook the food without having to worry that it'll get burnt or sticking to the pan. The food comes out tasting like barbecue but without the charcoal taste. It's like barbecuing inside the house without the danger of CO2. 553 customers found this review helpful. Did you? Yes, I did!